Maison 54 Pét Nat was a totally new wine for me and it was a revelation. If this is the quality of naturally sparkling wine, then sign me up for a case or two! But firstly, what’s in a name? The name ‘Maison 54’ gives a nod to the address in Paris where surrealist artists invented the collaborative drawing style. in 1925 Yves Tanguy, Jacques Prévert, André Breton and Marcel Duchamp played a game of drawing, folding the paper and passing to another artist. The name ‘cadavre exquis’ was the phrase that came to mind when they first played the game, ‘le cadavre exquis boira le vin nouveau’ (‘the exquisite corpse will drink the new wine’). A curious and rather bohemian name for a wine that is actually very easy to appreciate. Bottled while still undergoing fermentation, and at a lower pressure than other sparkling wines, Pétillant Naturel wines (also now known as Pét Nats) are relatively low in alcohol with a gentle bubble. 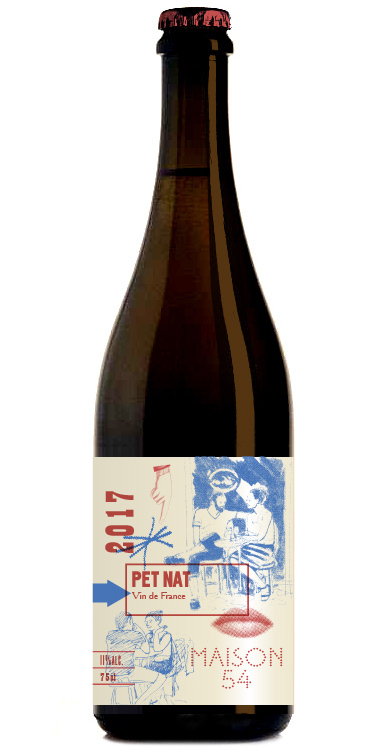 This is a delicious collaboration between Borough Wines & Beers founder Muriel Chatel and Master of Wine Liam Steevenson. Maison 54 is the home of limited-edition wines, exclusive releases and bespoke blends – and I want to try more of them. These pétillants naturels certainly are different from the ubiquitous prosecco and cava. There has been a recent upturn in popularity for this style of wine, although they have been produced for centuries in France. It’s made by the methode ancestrale which, as the name suggests, has been around for a while. The wine is bottled before all the sugar in the wine has been turned into alcohol. It then continues fermenting in the bottle, which might sound quite alarming. The resulting bubbles are soft and the wine is very slightly cloudy. Dry, bright and fruity with refreshing notes of green apples and citrus. It has great character and a good finish. This is the fizz for those who have thus far scorned anything other than Champagne. It is very definitely not a wannabe Champagne. It is dryer and much more interesting than the more predictable prosecco; it is proudly its own wine, and has my stamp of approval!